While Republican Trump has gone softer on Putin, calling him a "competitor" and "not my enemy" on Thursday, lawmakers from both parties hardened their warnings to Trump before he sits down with the Russian leader in Helsinki on Monday. "Putin is not America's friend, nor merely a competitor. Putin is America's enemy — not because we wish it so, but because he has chosen to be," Republican Senator John McCain said. Trump has touted the summit as an opportunity to reduce tensions, inflamed by Russia's annexation of the Crimea peninsula from Ukraine in 2014, its military backing of Syrian President Bashar al-Assad, which turned the tide of the Syrian civil war in 2015, and accusations of Russian meddling in the 2016 U.S. election. U.S. lawmakers want Trump, both privately with Putin and publicly, to condemn Russia's actions. 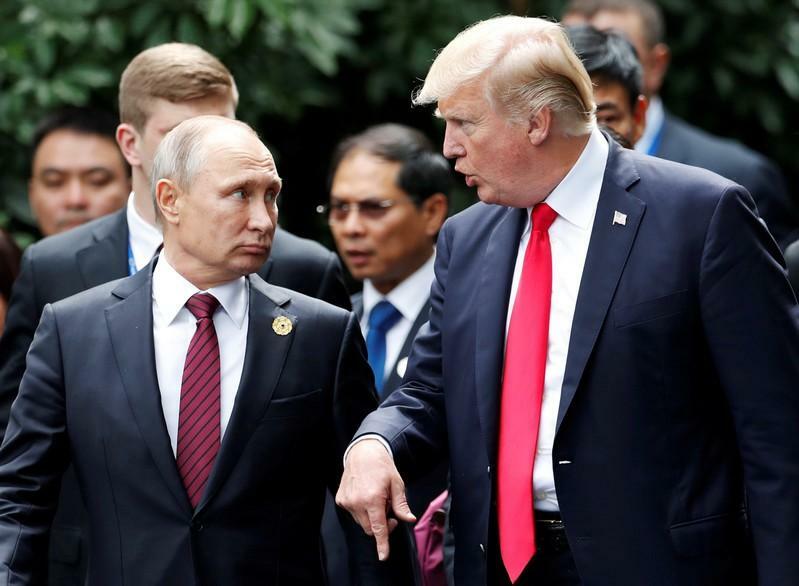 U.S. intelligence agencies concluded that Moscow interfered and Trump has said he would discuss it, although he has stated both a willingness to believe Putin's denials and U.S. agencies. Trump has described a special counsel investigation into possible collusion between Trump campaign aides and Russia as a political witch hunt. "Our goal must be to demonstrate to the world that the community of democratic nations does not intend to accede to Putin's or any other authoritarian's view of the world. We will resist Russia's aggression," Democratic Senator Mark Warner and Republican Senator Marco Rubio said in an op-ed in USA Today on Thursday. Trump declared that he had ended the nuclear threat from North Korea, but one senior U.S. official, speaking on the condition of anonymity, said: "Who's to say he won’t come out of Helsinki saying he and Putin agreed that Russia no longer poses a threat to the rest of Europe?" Worries over Trump's commitment to European allies and his deference to Russia loomed large at the NATO summit that wrapped up on Thursday. Trump claimed a personal victory after telling European allies to increase their defence spending or lose Washington's support. He particularly railed against Germany and Chancellor Angela Merkel. Trump took another swipe at U.S. allies when he told reporters in Brussels that he thought his meeting with Putin would be "the easiest" part of his week-long European trip. "The Russian president is a man schooled in treachery and espionage. He jails and murders his opponents, presides over a mafia state and he is an enemy of democracy. Why would a meeting with Putin be easier than a meeting with the allies that we rely on most to be a bulwark against him?" Flake asked in a Senate speech. Europeans and some U.S. officials are particularly concerned about whether Putin will ask Trump to suspend NATO military drills in the Baltic states on Russia's doorstep. Trump's assertion that Russia is a competitor and not an adversary is contrary to the judgments of U.S. intelligence agencies and his chief diplomat, Mike Pompeo, who at his April confirmation hearing to be Secretary of State, said the United States needs "to push back in each place we confront them," referring to the Russians. While Trump said on Thursday that he expects the Helsinki summit to be "just a loose meeting," some at home are hoping it will be a "non-event" with nothing groundbreaking. "Based on just the way things are shaping up, I think a non-eventful Helsinki meeting might be best for our country," Republican Senator Bob Corker, chairman of the Foreign Relations committee, told Reuters.